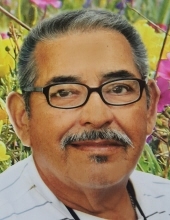 Alexander G. Rosales, a life-long resident of New Braunfels, passed away early Wednesday morning, November 14, 2018 at Eden Home at the age of 71. Alexander was born on December 21, 1946 in New Braunfels to the late Augustine Rosales and Victoria Garcia Rosales. Mr. Rosales was a heavy equipment operator for Dean Word Co., retiring after some 53 years of dedicated service. He was preceded in death by his parents; sister, Alicia Rosales and three brothers, Robert Velez, Alfredo and Martin Rosales. Survivors include his children, Johnny Rosales and wife, Kelly, Alex Rosales, Terry Martinez and husband, Alex, Mary Reyes and Nick Rosales; 12 grandchildren; Eric Rosales, Amber Cortez, Stephanie Garcia, Kristen Rosales, Alexander Martinez, Miranda Martinez, Dezmond Reyes, Jordan Bautista-Rosales, Lanie Rosales, Kyla and Keira Rosales and Royce V. Rosales; 15 great-grandchildren; brother, Peter G. Rosales; sister, Maryann Cruz; loving companion, Anna Rodriguez. In addition, Mr. Rosales is survived by his pet- best friend, Lucy. Alexander was loved by all of his family and friends and will be dearly missed. We would like to thank Matt Garcia and staff at DaVita New Braunfels for the 9 years of care they provided to our father. Visitation will be held from 5:00 PM to 9:00 PM with a holy rosary at 7:00 PM on Monday, November 19, 2018 at the Lux Funeral Home Chapel. The Mass of Christian Burial will be celebrated at 10:00 AM on Tuesday, November 20, 2018 at Our Lady of Perpetual Help Catholic Church. All services will end at the conclusion of the Funeral Mass on Tuesday morning. Please note: There will not be a procession from the funeral home to the church on Tuesday morning. All wishing to attend the Funeral Mass will need to meet at the church at 9:30 AM on Tuesday morning. Pallbearers will be Isaac Cortez, Zach Garcia, Eric Rosales, Vincent Rosales, Martin Rosales Jr., and Felix Rosales Jr.
To send flowers or a remembrance gift to the family of Alexander Rosales, please visit our Tribute Store. Holy Rosary to be recited at 7:00 PM. "Email Address" would like to share the life celebration of Alexander Rosales. Click on the "link" to go to share a favorite memory or leave a condolence message for the family.